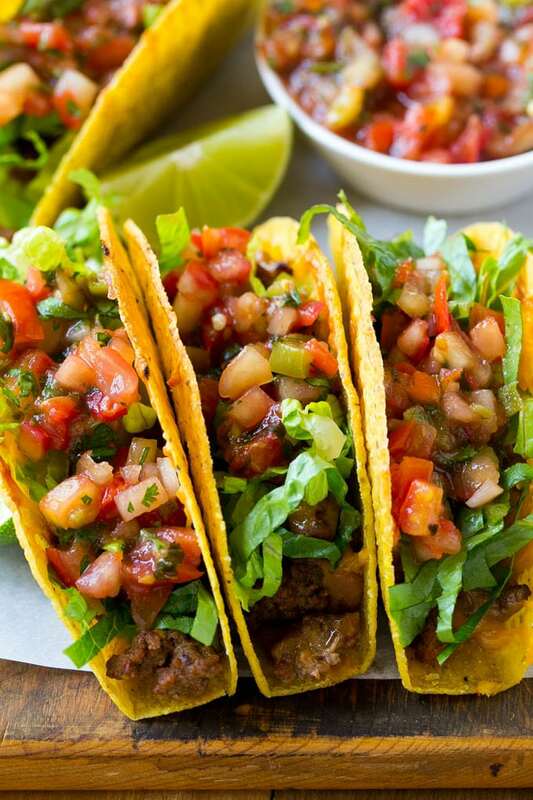 These oven baked beef tacos are filled with beans, meat and melted cheese, then topped off with shredded lettuce and fresh salsa. The best way to make tacos for a crowd! My family adores taco night, I often serve shrimp tacos, pulled chicken tacos, or these amazingly delicious beef tacos. This is a great recipe to please the whole family! Cinco de Mayo is almost here, and I am going to celebrate by baking up a pan of these amazing tacos! These oven baked beef tacos are so simple to make, especially when you need to feed a crowd. While these tacos are a festive addition to your Cinco de Mayo menu, they’re also perfect for any weeknight when you’re looking for a quick dinner – my kids devour these tacos every time I make them. How do you make baked tacos? 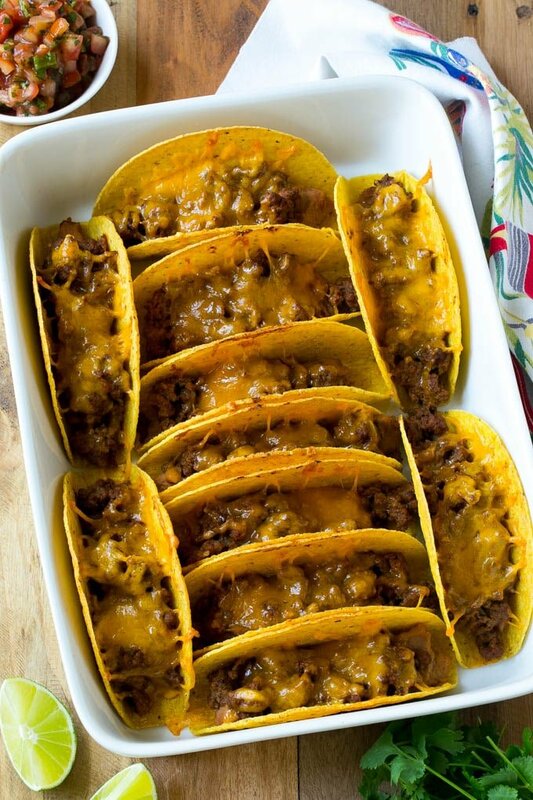 For these baked tacos, you’ll start with taco shells, ground beef, refried beans and cheddar cheese. I like to use the taco shells with the flat bottoms so that they don’t fall over in the pan. I typically can fit 10-11 taco shells inside a 9″x13″ pan. The taco shells are layered with the beans, meat and cheese, then baked to hot and melty perfection. I add the finishing touch to these tacos with shredded lettuce and a generous helping of Rojo’s. Rojo’s offers a complete line of fresh salsas and dips that taste like they came from a restaurant. 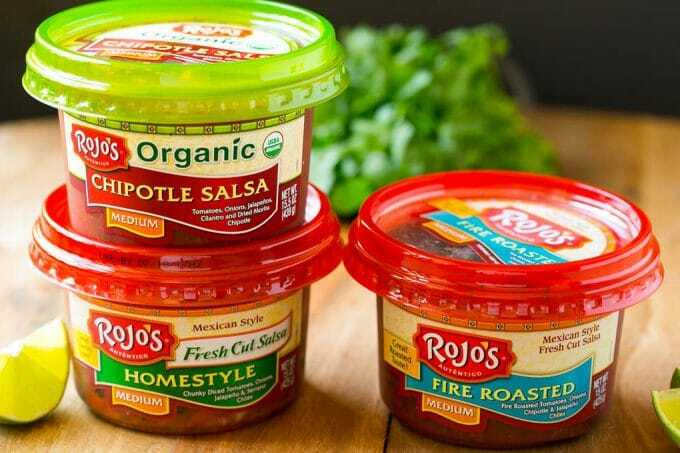 Rojo’s salsas are superior to jarred salsa because they’re made in small batches using premium fresh ingredients and time-honored family recipes. I used the homestyle fresh cut salsa for this recipe, but really any of the Rojo’s salsa varieties will work. I add the fresh cut salsa to so many dishes, everything from taco salads to grilled fish to add tons of flavor without a lot of calories! There are so many different ways to make baked tacos! While this beef version is a family favorite, I often switch things up a bit with different ingredients. Spicy: Use pepper jack cheese and add hot sauce to the beef mixture to taste. Avocado Lovers: Add 1 tablespoon of guacamole to each taco along with the salsa. Whether you’re having a party or simply looking for a family friendly dinner, these oven baked tacos are the way to go! The combination of the creamy beans, seasoned meat, melted cheese, crisp lettuce and fresh salsa is unbeatable. Preheat the oven to 400 degrees. Arrange the taco shells inside a 9"x13" baking pan. Heat the oil in a large pan over medium high heat. Add the onion and cook for 3-4 minutes or until softened. Add the ground beef and cook until browned, breaking up with a spoon. Stir in the tomato sauce, taco seasoning and salt and pepper to taste. Simmer for 3-4 minutes. 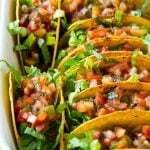 Divide the refried beans evenly among the bottoms of the taco shells. Top the beans with the ground beef mixture. Divide the cheese among the taco shells. Bake for 10 minutes or until cheese is melted and taco shells are lightly browned. Remove from the oven. 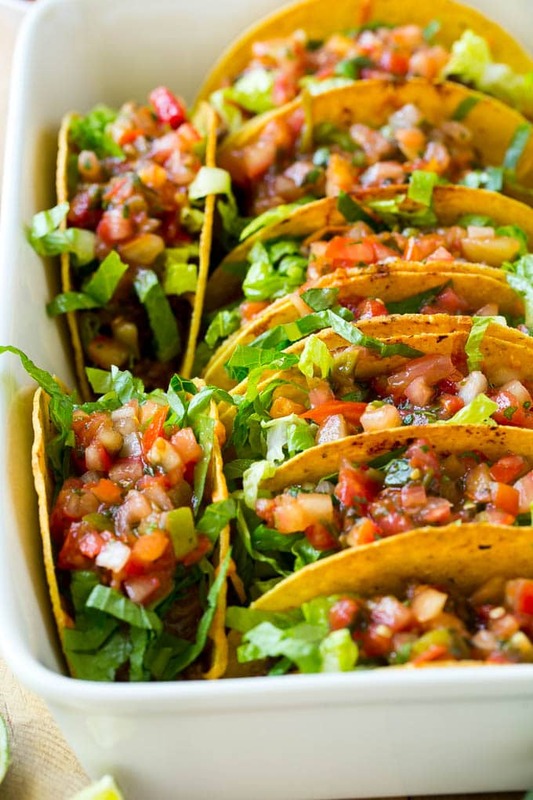 Top the tacos with lettuce and Rojo's Homestyle Fresh Cut Salsa and serve immediately. This post is sponsored by Rojo’s. Thank you for supporting the brands that make Dinner at the Zoo possible! Way to go. Another inspiration for a crowd. Thanks so much Evy I hope you enjoy! Ok, I realize this is a dumb question but do you heat up the beans before putting them in the tacos or do you just let them heat up in the oven in the tacos? They heat in the oven! Never thought of making them in the oven. Wow these are great!. We have a new recipe for Taco Tuesdays at our house!! Well, we eat Tacos any day. We love them. I don’t know why I never thought of this before. It was so easy to have all of the tacos done at one time. When we have a large group over, it’s difficult to get everyone their food at the same time. We have a few leftover, and while I know the bottoms will be a bit soggy, I think after re-heating them in the oven they will be just fine. Thanks for a great recipe! What size tub of salsa? What size can of refried beans? Delicious and will be a “keeper” in our house for sure! Thank you! I topped with shredded lettuce, sliced olives, guacamole, light sour cream and salsa! Fabulous! These were really yummy, my bottoms got kind of soggy, but I think it was b/c the meat was a little higher in fat, I probably should have drained it out after browning., I will try that next time. Thanks for the yummy recipe. I would love these but there is only 2 of us and I’m very conscious of waste. Is there anyway I can do up the bake part and freeze? Then pull out 4 and process. A jar of salsa won’t go to wast, nor lettuce. But the beans, yeah. I don’t make any of this type food because of the money waste but I sure miss the food. I don’t think you could freeze the assembled tacos, but you could definitely freeze the cooked seasoned meat and also whatever leftover beans you have! Dear Dinner at the Zoo, I made something similar last night, only I pressure cook chuck steak til it falls apart instead of the minced beef. I used a can of tomatoes and added a can of refried beans and Corn kernels to the meat mix. The result was soggy bottom tacos. If I leave out the refried beans and smear them on the bottom as you have done will that stop my soggy bottoms? It sounds like the can of tomatoes may have contributed a fair amount of moisture too. For this recipe, the tacos come out crispy but if you let them sit for a while they might get soggy too. Perfect and colourful ! Thank you so much ! Wow this is a great idea for a crowd! My family would go crazy over this dish! We love tacos! Oven tacos! Wowww I must try. Thanks for the inspiration. Definitely making these for Cinco de Mayo!